Gun control advocates and victims of crime joined David Shoebridge and ALP Member for Prospect Hugh McDermott at NSW Parliament House today to call for a ban on the importation of the Adler A110 lever action shotgun, a quick fire weapon that can deliver 8 shots in 8 seconds. 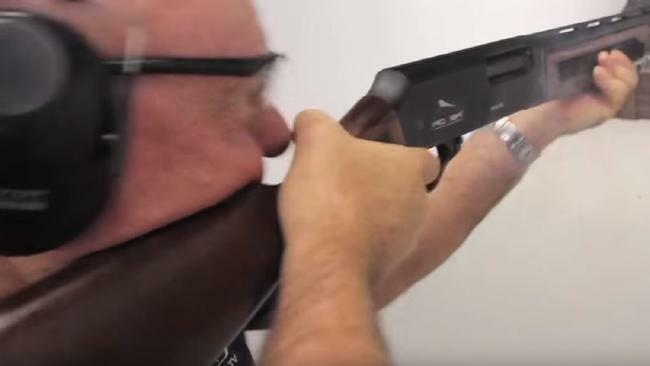 The media were asked to watch this video from the Sporting Shooters Association which proudly claims the Adler A110 is uniquely designed for Australia’s gun laws – a way of circumventing the strong controls put in place following the Port Arthur massacre. Watch from 7:28 on. AUSTRALIA’S newest shotgun can fire eight bullets in eight minutes and anti-gun lobbyists claim it has been designed to circumvent the country’s tough gun laws. They are as powerful as a pump-action shotgun — like the one used by Martin Place gunman Man Monis — but will be available to any recreational shooters holding Category A licences who are usually restricted to single-shot firearms. More than 7000 of the Turkish-made Adler110 lever shotguns are on order in Australia. Mary Cusumano, whose husband Angelo was shot dead in his store in 1995, yesterday joined the push to ban the Adler110, which has an eight-shot magazine but unlike other rapid fire guns is not restricted to the limited number of licence holders with Category C and D licences. More than 7000 of the Turkish-made Adler110s are already on back order at $795 each ready to arrive when a temporary Federal Government ban on them ends in August next year. “I can’t understand what we are doing even thinking about allowing the Adler 110 into this country,” mother-of-four Ms Cusumano said at NSW Parliament House today. Martha Jabour, Executive Director, Homicide Victims Support, with Mary Cusumano at the anti-gun rally by Gun Control Australia at NSW Parliament House. She said there were laws protecting the public from speeding drivers, drunk drivers and to make backyard pools safe. “We are not protecting anyone by allowing this,” Ms Cusumano said. Anti-gun lobbyists say the Adler110 has been designed specifically to circumvent the country’s gun laws introduced after the Port Arthur massacre. Today’s launch of a campaign to ban the gun coincides with a meeting of the country’s police ministers, Attorneys-General and justice ministers in Canberra today where NSW Greens MP David Shoebridge said they would be discussing the gun laws. Former Prime Minister Tony Abbott intervened in July to temporarily ban the Adler110 7+1 shotgun, saying the imports would be halted until after the completion of the National Firearms Agreement. The review, which was initiated after the deadly Lindt Cafe siege, will also consider the Adler110. But the ban will be automatically lifted in August after negotiations by controversial Senator David Leyonhelm. The guns are being imported by Robert Nioa, the son-in-law of federal MP Bob Katter. Designed 130 years ago to circumvent laws? Daniel, you spelled baseless emotion wrong. Lastly, is rapid-fire the “assault weapon” of down under? Wow what a bunch of tripe. Class A licence holders have never been restricted to single shot firearms. In fact over 4000 lever action shotguns are already owned on A class licenses in NSW. Time to stop spinning crap and tell the whole truth. Saying that people who hold a category A licence are usually restricted to single shot firearms is completely false. Cat A is all rim fire rifles with a magazine capacity of 10 or less not including semi automatic. All shotguns including lever action not including pump or semi automatic. Been that way since 1996 NFA. Saying that a lever action shotgun is just as powerful as a pump action is correct but misleading because it is just as powerful as every other 12 gauge shotgun on the planet including single shot. Only power variation come in the size of the cartridge you use. They also do not fire “bullets”, that’s rifles that do that. This is not even close to new technology as there are plenty of IAC and Chippa lever shotguns in the hands of Australians that hold up to 9 shots. In one paragraph you claim the shotgun can shoot ‘8shots in 8 seconds’. Another ‘8 shots in 8 minutes’. Which is it? You mention the shotgun shoots bullets. It doesn’t. You mention the Adler is just as powerful as a semi auto shotgun, it is also just as powerful as a single shot 12 guage. Category A is not restricted to single shot firearms. The Adler does not have an 8 shot magazine. I am extremely sorry for Ms Cusumano’s loss. There are laws to protect people from firearm crime. The Adler has not been specifically designed to circumvent Australia’s gun laws. It has been designed to fit within the laws. Not unlike any vehicle or electrical appliance that is imported. You call Senator David Leyonhelm controversial. I would call you, MP David Shoebridge controversial. I would suggest that you check your facts next time you post an article. Category A is not single shot. It includes rimfire and shotgun rounds of all actions. They are put in category A because their effective range is quiet small. The only shotgun not in there are semi, auto and pump action 12g. A few points you failed to consider in your hoplophobia hysteria. Firstly the reload time on a lever action is extremely slow. Comparing it to a bolt action with a box mag, your hysteria is comical. Next point, do you realize that focusing on a 800,000 member group of law abiding citizens in an effort to curb the illegal actions of a few is only taking valuable reasons away from stopping the illegal actions. You are so miss guided with hatred for firearms that you cant see the benefit it has to native wildlife. Did you know that the only people in Australia who dispose of feral cats are law abiding recreational shooters. Do you get out there and shoot ferals so that our native animals aren’t getting mauled to death? My last point which is more just pointing out your blatent lie is this firearm is already here and has been here since the mid 1800’s. It has never been used in a crime, why would it be when a criminal has access to semis and autos. There is no way in hell a criminal wanting to cause a massacre or any other attrocity would source a lever action. Use your brain for once and leave your emotion out of it. When will you stop the misinformation, lies and fear campaign ? Lever action shotguns of the same action and caliber have been in Australia for 130 years. 7 shot lever action shotguns were here when the laws were changed in 1996 and were allowed to stay. So how is it now somehow designed to get around those laws ? It is as powerful as any shotgun as the all fire the same cartridges. Pump actions are cat C and D because of the action not the caliber. Why do you continue to portray law abiding shooters as criminals when the facts show otherwise ? To use the blood of victims of criminals with illegal guns to further your own agenda is discraceful. the gun design has been around for over a hundred years. why is it continually being reported that its a new design to “get around ” australian gun laws? ?